Good day to all. Today there will be a small review of exercises with dumbbells. I think this article will be useful to those guys who do not have the opportunity to regularly visit the gym and train mostly at home. You can train at home and with a barbell, but for this, in any case, you need additional devices in the form of racks, brackets, free space (if you are not an oligarch living in a mansion, then you understand what I’m talking about). In general, this complex is the best option for guys involved in the training at home. In addition to dumbbells is that training is done with free weights, according to an individual trajectory for each athlete, which is optimal for muscle development. In this, a huge minus of all simulators, in which the trajectory of movement is laid in advance and the same for all. If you are lucky and you have enough solid weight dumbbells, then you have the opportunity to work out almost all muscle groups as well as in the gym (no, of course, they will not replace the deadlift or squat, but it will help to get stronger). Exercises with dumbbells are suitable for almost any athlete. Whether you are an athlete who wants to gain lean muscle mass, or a plump office worker who wants to lose a dozen kilograms by summer, or a vigorous retiree who makes a lightweight complex with a small weight to keep yourself in good shape. In general, regardless of the goals pursued, dumbbells will become faithful assistants in achieving them. You can talk about the benefits of this type of training for an hour. In addition to the targeted action on skeletal muscles, the performance of this complex increases the blood supply to the heart muscle, improves the functioning of the lungs, ligaments and joints, improves the metabolic processes in the body. In short, who are interested, you can search on the Internet. Well, we will proceed directly to the complex itself. In the picture are my first dumbbells. Squats. As a rule, this exercise is performed with a dumbbell on the chest. Therefore, it is difficult to imagine doing the exercise with a lot of weight. It is impossible to build up huge legs, of course, but it is quite realistic to add volume and relief. Leg extension. For this exercise, it is necessary to make straps on dumbbells, and put them on the feet with these straps. Next, sit on the edge of the chair and do the extension, as in the simulator. In general, everything is simple. Rise on socks. This exercise is identical to doing it in the simulator. The only difference is that, holding the dumbbells in each hand, it will be difficult for you to keep balance. Weights and dumbbell extensions and pullovers are performed in the same way as in the gym. In my case, the role of the bench was performed by two stools and a thick plaque between them. The design turned out quite tough and stable. Dumbbell in the slope is no different from doing it in the gym. Instead of a bench, I used the edge of the sofa. It is even more convenient. The extensors of the back train quite well by straightening the body with a burden behind the head (this exercise seems to me extremely traumatic for the loins, I immediately excluded it from my program). Dumbbell shrubs are also identical to those in the gym. Different flexion of arms for training biceps are not much different from those in the gym. For training the triceps, you can use the extension of the arms above the head, alternately, or both hands, the extension of the arm in the slope. 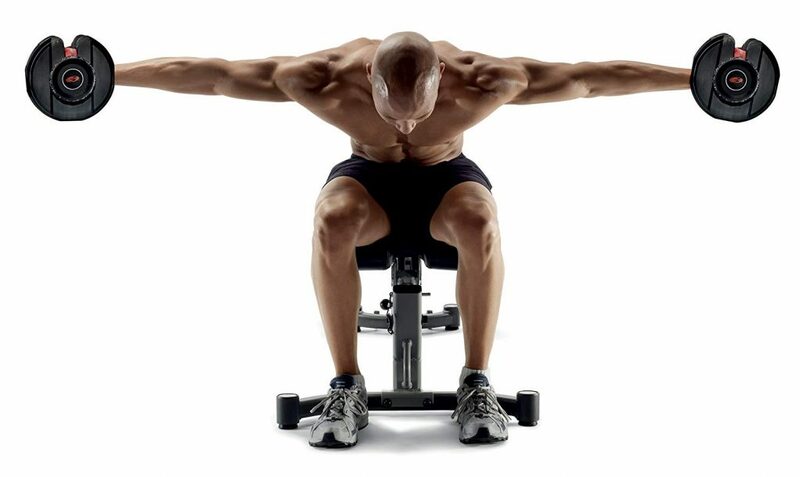 Deltoid muscles can be successfully exercised with a press over your head, or by breeding to the side. So, friends, we reviewed the basic exercises for training at home. With only two collapsible dumbbells, you can work out well all the major muscle groups. I hope you enjoyed the article. Do not forget to subscribe to blog updates and receive fresh articles to your email.